I have a best friend who lives in heaven. Her favorite animal on earth was the pig and so today I am remembering her with this picture that came to me from Pinterest. I took some time out to do a little research about this animal which sometimes gets only derogatory comments. Pigs have excellent memories. Studies have shown that pigs can remember where food is stored and places where they have found food before. They can also remember directions and can find their way home from great distances. 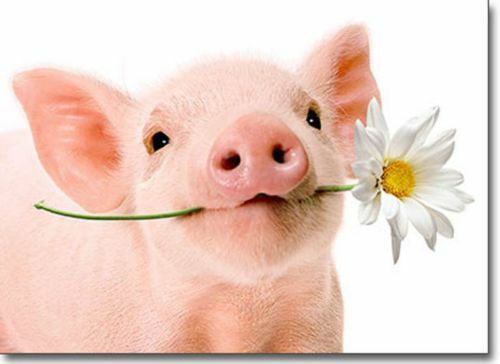 Pigs can recognize and remember humans and up to 30 other pigs. In the Chinese zodiac, the pig represents fortune, honesty and happiness. How appropriate for this honest, happy animal that is smart, lovable and forgiving.